The headline in the BBC News is “Fat ‘disrupts sugar sensors causing type 2 diabetes’” The article does not attribute the quotation in the headline and the first sentence says “US researchers say they have identified how a high-fat diet can trigger type 2 diabetes, in experiments on mice and human tissue.” Should “mice” or “tissue” have been in the headline? Should the article itself point out the extent to which mice respond differently, sometimes, oppositely from humans, to high-fat diets? How strong is the evidence in light of other work? Is the article altogether prejudicing the reader against fat which is the official position of both private and government health agencies? The article in question may have some sins of omission but it is certainly restrained if not actually circumspect. The general problem, of course, is whether we get accurate scientific information from the popular media. Crisis in Nutrition III: Was the Government Standard Met by the 2010 Dietary Guidelines? The abstract of my first talk is presented below. It is, of course, a tricky area. Within some legal limits, reporters can say what they like. A researcher speaking in a public venue, personal blog, social media can similarly pretty much sound of as they choose. Or can they? If they are identified as an expert or are have credentials based on a employment by a prestigious institution, don’t they have to clearly distinguish between opinion and fact? And does the headline have to say that, for example, the high-fat study was done in mice? All of these are gray areas and motives are hard to discern. I focussed on one area that seemed more clear cut. If an experimental study is reported in the media or in a press release from an academic institution (sometimes the same thing), is there an obligation to be sure that any opinions attributed to the investigator derives from that research unless otherwise indicated? The public relies on popular media for descriptions of nutrition research. Of particular interest is carbohydrate-restricted diets, the major challenge to official recommendations. The goal is to assess the extent to which statements to the media and press releases accurately represent the results of research. Nutrition is an area of great interest to the public but one where matters of scientific fact and policy are contentious. Authors of research papers should sensibly have great freedom in describing of the implications of their research, but have an important role in explaining to the public when that opinion does or does not follow directly from the publication. Two examples are given of where this is a critical issue. In one, an animal study (Foo, et al. Proc Natl Acad Sci USA 2009, 106: 15418-15423), the accompanying press release implies that it was motivated by observations of patients in a hospital, observations which were purely anecdotal and unsubstantiated. In a second example, a press release stated that carbohydrate-restricted diets (CRDs) were not included in a comparative study because of their low compliance (Sacks, et al. N Engl J Med 2009, 360: 859-873). No data were given to support this allegation and, it is, in fact not true. The study concluded that the macronutrient composition of the diet was not important even though, as implemented, dietary intake was the same for the groups studied and, again, the CRD was not included in the study. It seems likely that that this would have an inhibiting effect on individuals choosing a CRD and represents an important impact of research integrity issues on the community. Practices where research directly affects the community should be evaluated and guidelines should be generated by academic societies, scientific journals and the popular media. What constitutes appropriate press description of published research should be defined. Reasonable principles are that only those specific conclusions that derive directly from the publication are relevant and authors make clear what is their personal opinion and what is the product of research data. It is important to emphasize that ORI is sponsor of this academic conference and is not related to is regulatory function. ORI is charged with overseeing federally funded research and emphasizes its role as watchdog in detection and prevention of research misconduct, assisting the Office of the General Counsel (OGC), dealing with suspected retaliation against whistleblowers, and responding to Freedom of Information and Privacy Acts. Its usual activity involves pinpointing specific fraud. The website reports, for example, a final judgement against an Assistant Professor at the Boston University School of Medicine Cancer Research Center who published two papers in which he had fabricated data shown as figures in the paper. He is required to retract the papers and not enter into contracts or sit on advisory panels for two years. ORI, in general, has the same relation to the research community that Internal Affairs has to the police. Of course, in research, although there are substantive rewards, blatant fraud is generally pathological: if the results you are falsifying are important, they will surely be repeated and the misbehavior discovered while, if they are not important, the rewards are not likely to be spectacular although, especially these days, keeping your job is desirable. The suspicion about ORI is also bolstered by their behavior in the Baltimore case in which they were part of the mindless zeal and witch-hunting whose appearance in human interactions seems to have such a low activation energy. David Baltimore, a Nobel laureate in Physiology or Medicine and, at the time, MIT professor, had co-authored a paper with an immunologist named Thereza Imanishi-Kari who was accused by a postdoctoral fellow of fabricating data. In the end, nothing came of it but there was much sound and fury and many idiots participated in the tale including the Secret Service (who I was taught were only supposed to protect the President and prosecute counterfeiters). The details of the Baltimore case are well told in capsule form in the Wikipedia entry. Daniel Kevles wrote an outstanding book, at least judged by the first half — the content was too infuriating for me to keep reading. In any case, after most of the furor had died down, the ORI persisted and found Imanishi-Kari guilty of research misconduct, a ruling overturned by an appeals panel of the Department of Health and Human Services (HHS) which “found that much of what ORI presented was irrelevant, had limited probative value, was internally inconsistent, lacked reliability or foundation, was not credible or not corroborated, or was based on unwarranted assumptions.” the ORI reputation has probably not recovered from this but it remains one of the few oversight agencies which, at least in nutrition, is sorely needed. 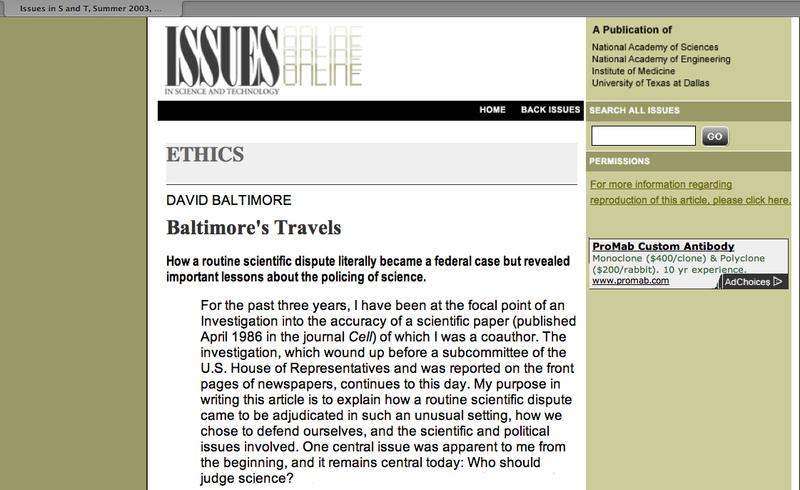 David Baltimore wrote his own description of the events and emphasized that it raise many questions, in particular, “Who should judge science?” and “How does one distinguish between error and fraud? And does science do an adequate job of policing itself?” The conference and this blog will discuss these matters which the crisis in nutrition has made of critical importance. Such philosophical questions were formerly what most of us would have preferred to simply gab about in Starbucks. What I find largely lacking from most internet discussions about nutrition and, particularly, about causes of obesity, is the paucity of consideration given to the dire effects of many prescribed medications. I myself gained a great deal of excess weight as a consequence of taking HRT, and much later discovered that sodium and water retention had caused this, and cause similar harm to other unfortunate people who gain weight when taking prescribed steroids. I was consistently given inappropriate advice from the medics I consulted about what to do about the weight gain – advice that was usually accompanied by sneers and insults. There is certainly a widespread ignorance among doctors and their retinues that the most effective way to prevent or to reduce excessive weight gain from steroids (and antidepressants, antipsychotics, some anti-epileptic/anticonvulsant drugs, etc) is to avoid salt and salty food as rigorously as possible. Okay, I’m way over my head even trying to comment on this. I am a skinny little low-carber trying to live as close to primal as I can with my husband and my five kids . . . four of whom are old enough to object, and two of which do so on a regular basis (not coincidentally, these are the two with the most health problems). So, I daily argue the benefits of low carb in and out of my home. Those are my creditials. I do not believe the media should be governed. It is a shame that people accept opinions for fact, or that opinions are presented as facts, especially by supposed experts, but I believe it is wrong to hold anyone more accountable than the public themselves. How many times has someone told you an account of the news and when you read the article yourself you saw another story entirely. It’s not unlike the child’s game Gossip. I suggest people’s money, time and efforts would be better spent making the actual research more accessible, or educating the public on science, than regulating how individuals interprut it. Because of the complications and the obvious dangers in messing with freedom of the press, my talk and the post is rather narrowly focussed on the responsibility of researchers and their institutions in providing information to the popular press. On the other hand, I completely agree with what you say here. It is only that there are not such sharp lines between the government and the private sector, especially as it applies to scientific research. The press is currently reporting on a study on red meat and diabetes from Harvard School of Public Health. As you say, a critical factor is access to the original article but it was published in American Journal of Clinical Nutrition (AJCN) and a subscription is required. The SUNY Downstate Library recently stopped their subscription (budget crunch and all that) so I don’t have easy access to it. Now AJCN is published by American Society for Nutrition (ASN) who, on the face of it, can do whatever they want. Maybe. After all, they have not-for-profit status. People on the editorial board are frequently supported by government grants as is the Harvard School of Public Health. So we are stuck with the PR from Harvard and/or WebMD or whatever. Admittedly progress towards open access publishing is moving rapidly but how slowly is ok if you are raising your kids. It is always better if there is internal self-management rather than government control but the lines are not completely clear and the whole issue is whether organizations are anymore socially responsible than a government agency will be. Government regulations can get out of hand and become bureaucratic but many arise from the failure of self-policing. The authors of this article never said that dietary fat per se leads to diabetes. What they said was that a high-fat diet *with associated obesity* leads to diabetes because obesity is associated with increased chronic high FFA levels. We know that mice get fat when given fat in addition to their normal chow diet. “Dietary stimuli leading to obesity trigger this process,” they wrote. So if humans get fat by eating fat, then they’ll increase risk of type 2. But if they lose weight or fail to gain weight by eating fat and limiting carbs, then the high-fat diet will reduce their risks of type 2. Obviously the media misinterpreted what the article actually said. They said “fat” (implying dietary fat) instead of FFAs. The problem is that diabetes cannot occur without insulin resistance, and eating fat does not cause a pancreatic response. So the conflict is within the focus on strictly the intake of dietary fat. Without sufficient blood-glucose and resulting insulin resistance, type II diabetes isn’t likely to occur (it would be difficult to manifest from protein intake). This is a misconception at the foundation principals, taking one thing and calling it something else. Give fat with carbs (and in some cases excess protein) and of course, blood-glucose can rise along with stored fat. But just give fat and reasonable protein intake, as well as carbs less-likely to induce a pancreatic response (such as fiber), and it’s not likely to happen. There’s far too much generalization going on with articles like this. I had the same frustration with that Harvard School of Public Health study on red meat and diabetes. Like you, I am affiliated with a large academic institution whose libraries no longer subscribe to the journal in question. Well, epidemiology and nutrition are not my fields, so I can’t complain too much, but I do have a professional interest in communications. The typical “rhetorical package” in these situations includes the press release and any interviews given to the news media. The researchers use these tools to shape the opinions of millions of people who will never see the study itself, nor have any interest in reading it if they did see it. The HSPH folks knew perfectly well that many news outlets would just say “eating red meat causes type-2 diabetes” and leave it at that — a causal claim the HSPH wouldn’t dare make in a study based on observational methodology and self-report data. At least, I assume they wouldn’t dare make it. A high fat diet that has 32% of fats as PUFA – isn’t that your heart-healthy oils? Interesting links. In general, a “high-fat diet” is different in many strains of rodents than in humans. In humans a high fat diet with low carbohydrate is beneficial whereas in, at least C57bl6 mice, even at low carbohydrate, a high-fat diet will lead to obesity and other problems although the problems in diet composition that you mention may be important too.